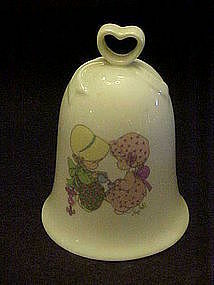 Another cute sentiment bell made by Enesco 1994. Two little Precious Moments girls having a spot of tea. On the back it reads "Friendship hits the spot". Heart handle but the clapper is missing. No chips or repairs.